Pratt & Whitney began its experimentation & development of double-row engines in 1929. The advantages of the double-row power plant for aircraft were that a larger engine displacement could be achieved with no increase in the frontal area of the engine (truly a savings of drag on the airplane!). Smaller cylinders could also be used which permitted greater crankshaft speeds creating smoother operation. 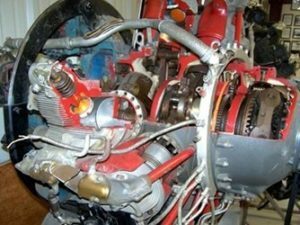 The smaller, more frequent power impulses also contributed to engine smoothness of operation and longer engine life between overhauls. The two cylinder rows are staggered and in many cases baffled via sheet metal so that cooling air effectively reaches the rear row, yielding the same cylinder head temperatures as the front row. The R-1830 is a fourteen cylinder, double-row, air-cooled radial engine of 1,200 hp. The engine has an internal 1-stage supercharger that is a centrifugal type. The engine in this museum has been cut away or sectioned so that you can see many of the internal parts and features. If you look closely you will find the internal supercharger. The Twin Wasp enjoyed record-high production volume for an aircraft piston engine: 173,618 units from 1931 to 1951. That was due in part to the enormous WW II production of B-24 Liberator 4-engine bombers. The following partial list of aircraft applications includes Consolidated B-24 Liberator and PBY Catalina flying boat, Curtiss P-36 Hawk, Douglas DC-3/C-47, Grumman F4F Wildcat, and Republic P-43.